Oatmeal cookies of any kind, have been my familyâ€™s favorite ever since I started making cookies. The chewy oats packed in a soft and sweet dough make anyone crave for more. Todayâ€™s recipe is going to be a blast for you. 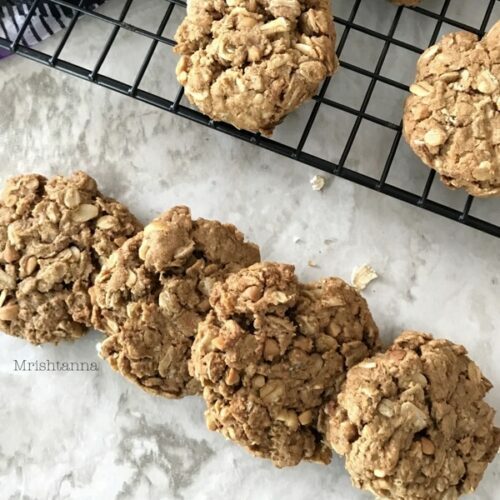 I was trying for a hearty, old-fashioned cookie…so I made this peanut butter oatmeal cookies with just a few ingredients. I made these cookies at about noon yesterday and by 3:00 pm, they had all disappeared! Thatâ€™s how good they were. Itâ€™s possibly one of the most simple of all cookie recipes out there and probably the one that you can modify to your preference. I used brown sugar and peanut butter, but you can always go with agave or maple syrup for sweetness and also add a cup of chocolate chips. My regular readers know this very well, but if you are a first time visitor, you will find it surprising that this cookie requires no butter or eggs! My egg replacement in this recipe has helped hundreds of readers in switching to a vegan lifestyle. Try it out if you have never tried it. I have shared several recipes in the past such as Easy Vegan Honey Cake Recipe, Rustic Almond Chocolate Chip Cookies and Cucumber Walnut Bread with the flax seed replacement. Check out those recipes too. Next time your kids demand cookies, you can be ready with warm, scrumptious cookies in less than 20 minutes! If you enjoy yummy, vegan recipes such as this, get them directly in your inbox by subscribing to my newsletter. Just hit the subscribe button at the right. You will also get a copy of my e-book where I have put together some simple vegan dessert recipes and dessert essentials. My readers have found it very helpful and I am hoping you will too! 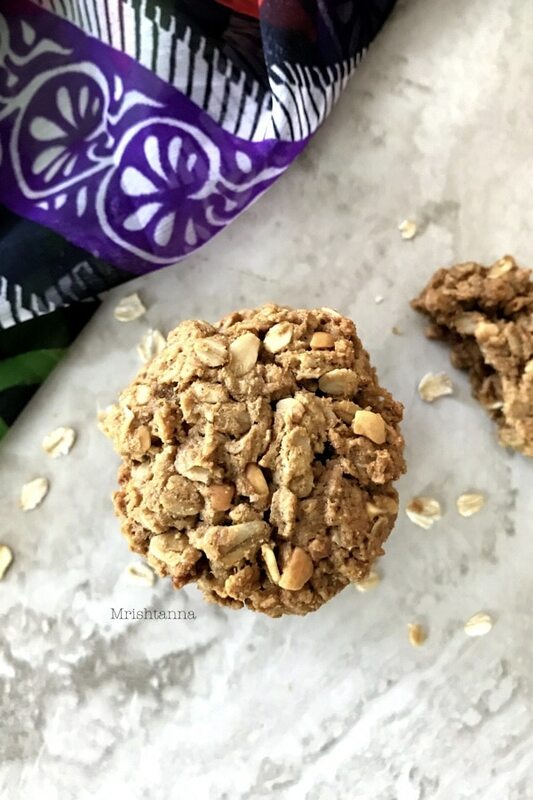 I was trying for a hearty, old-fashioned cookie...so I made this peanut butter oatmeal cookie with just a few ingredients. I made these cookies at about noon yesterday and by 3:00 pm, they had all disappeared! Thatâ€™s how good they were. Meanwhile, in a small bowl mix flaxseed meal and water and place it aside. In a big bowl, add the dry ingredients: oatmeal, baking powder, and cinnamon powder. Mix thoroughly. In another bowl mix peanut butter and brown sugar. Mix evenly and then add the vanilla extract. Stir well to get an even mixture. 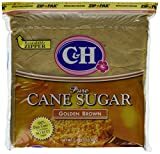 Combine this with the dry ingredients mix and the flax seed meal. Mix well and add 2 teaspoons of water, if required. Make small, round balls and place them on a baking sheet. Press gently to flatten them. Peanut Butter Oatmeal Cookies are ready! Eat Responsibly! The peanut butter and oatmeal cookies looks so scrumptious, loved the recipe would love to try it soon. I love peanut butter flavoured cookies. But, haven’t tried one at home. Bookmarking your recipe. Peanut Flavoured Cookies are the best for kids snacks box.. Oatmeal is the best filling addition.. Thank you Sujatha! Yes true 🙂 likely my kids are not allergic to peanuts! These cookies without any flour have turned out so good. They look just too tempting. Those cookies look so chunky and chewy. Peanut butter in the cookies is a great addition — makes them protein rich and delicious. Uma, these cookies are so healthy. yummy. Looks fabulous. What a delicious and healthy cookies. With kiddo answering for her exams I need to make these for her as she loves cookies. Super crunchy delights and the addition of peanut butter along with rolled oats certainly gives a great flavour. The best tea time snack option. Home bakes are always special and taste amazing. Love this eggless version.. Loves divine and yumm.. 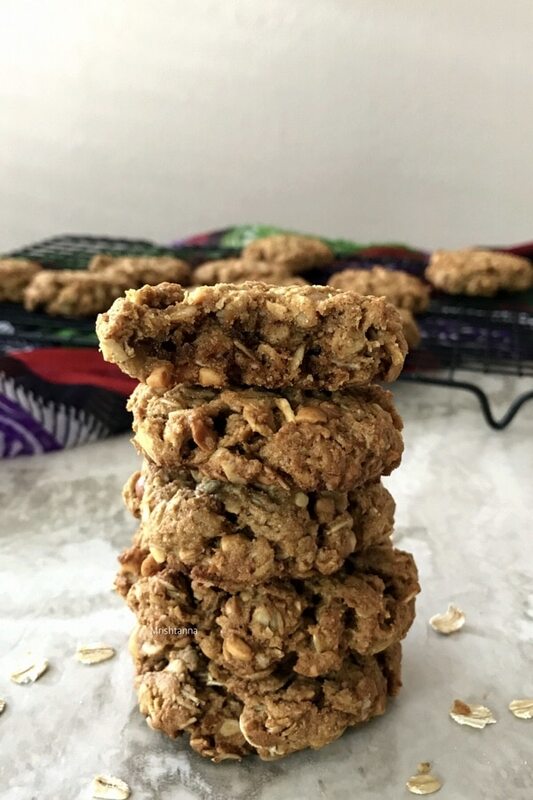 The peanut butter and oatmeal cookies looks so amazing, loved the recipe ..
Ahha, so happy that this is an eggless version. Looks so yum !! My all recipes are vegan:) Thank you Sasmita! How crunchy those cookies looks. Feel like having some with a cup of milk. Excellent snack box friendly cookies as well. Loving it. Such lovely cookies here. They look amazing and a definite hit with kids. Peanut butter cookies with oatmeal are so healthy and tasty. Love the texture of these cookies. 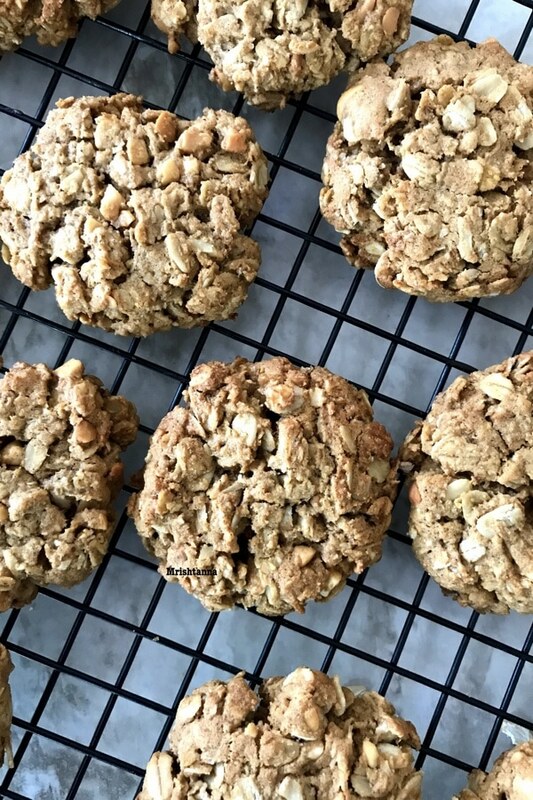 Today only I though about making peanut butter with oatmeal cookies. They taste delicious and perfect for tea time or as a snack. With the kids holidays coming up, I need such recipes. Peanut butter is o e of their favorite flavors and this will surely be a hot at home! This will be very fun to kids. Thank you Padmajha!